Always have… if I am honest to some extent. I’ve “never” considered myself at least solely a writer… I follow my passion, and commit! A vision of how things can be better… not just for myself but others! Nope… I actually perhaps precociously, chose not to go to university, so I did not feel tightly channeled or conditioned… I think I did the right thing. A few years ago I witnessed discussion on a chat-style, where they were reviewing books of young upcoming writers – who were in the line up to win a number of quite prestigious literary awards. The general consensus seemed to be that you could actually tell which university the entrant attended by the style of their writing, which I certainly do not feel is a good thing! However university ‘can’ of course be a good thing, but I really do think universities… and ‘any’ place of learning and “society” for that matter, must have a more ‘open minded’ approach for those who aspire to learn and be more! Notwithstanding I do work in different colours… so I have ‘blue’ as my text, as I feel it is warmer; green for something I am working on; red if a word is possible serious error or time inconsistency etc within the story; purple for something, which is background piece to the story. Fiona: How did you arrive at the title? The book I am working on presently is a comic fantasy titled… The Tallest Dwarf this irreverent muse came to myself while watching that rather ‘classic’ of a film… ‘Highlander…’ I believe really the very first of its genre! Anyways… I digress; while watching this, as I was struck by the thought of how absurdly conically ironic it would be if a character unlike Conner McCloud who was banished for being actually immortal – if the lead hero were to be rather excommunicated for a dwarf being conversely too tall? The ‘spark’ for the idea still makes myself smile now… please feel free to read the synopsis for the book. Ahhh, people can work together to create a better future for not just themselves but for ‘all!’ Life is fun, but we must have ‘substance’ to mean something… “Freedom of Spirit” is essential to this and leading a fulfilled happy life. ‘What’ in this reality… or the others? Being a bit mischievous, but have a peek at Quantum Physics, and you still tell me what “Reality” actually is? Quirky Claus, was the result of a dream, as I said… Who was it who said? “A good book tells you about the characters, a poor book tells you about the author.” However I think ‘all’ books tell us something about the author. I like to think my message is… there is strength in being different, and people of difference may also come together and be better for this “be more than the sum of their individual parts…” a ‘paradox’ of sorts! Easy… Belgariad by David Eddings, but I was greatly disappointed by other works of his. I also really loved Mordant’s Need two books by ~Stephen Donaldson. Not to mention of course Terry of Sir Pratchett notoriety, who’s books I have more consistently read for twenty years! I take my inspiration from various people, from Terry Pratchett, to Eddings… to friends on Twitter who are more personal mentors such as in particular Nat Russo author of Necromancer Awakening who’s time and dedication to helping myself progress has been of an exceptional caliber, and he was kind enough to compile a post-review on the book, as also has Ian Hutson! More recently… Nicholas Rossis who I met through Nat has also offered a generous level of support and encouragement. Terry Pratchett… but we should always challenge ourselves. Having said that I do read a lot of Terry’s work, and I really intend to step out of this genre, when life is not quite so hectic… and I am indeed more settled. Yes, I have gained something from all authors I read, ‘but’ do I feel “most” traditional authors are being complacent, but absolutely… “yes!” Have to say… I’ve personally felt more interested and challenged by many of the upcoming typically unknown authors! Recently tried this book by Kevin Harkness and series recently, which I really liked in many respects. When it comes to traditional authors, I have to say 3 out of 4 books I find myself feeling disappointed with. We must challenge ourselves to think differently, and question the status quo. 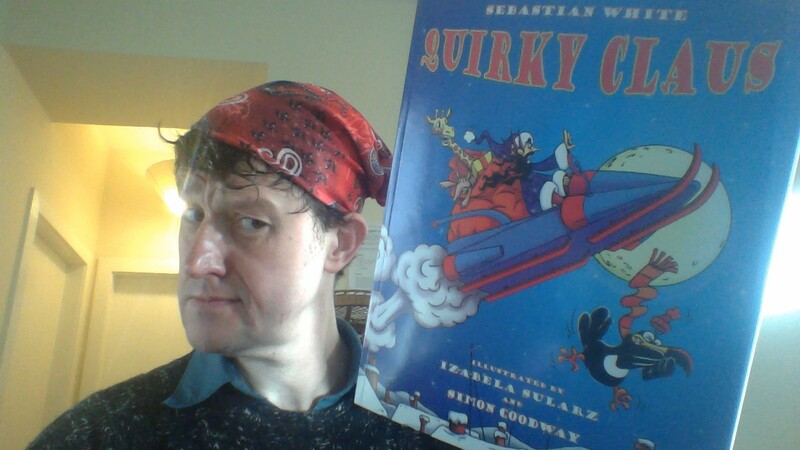 As well as Quirky Claus, and The Tallest Dwarf, I also have a blog, which is a challenging conjunction and juxtaposition of politics and comedy: SebastianWhiteWrites.Wordpress.Com find this a peculiar question in some respects Fiona, we must ‘never’ limit ourselves! Nat Russo and cohorts… you know who you are! A Prince Hedge’s His Bets. It was a day… of rapidly changing circumstances; clouds shifted swiftly, across the rarely seen backdrop of a crystal blue sky. Occasionally fractured beams of light managed to break through the pervading carpet of clouds, only to momentarily hit the rolling emerald green hills and shatter into many broken shards of fractured actinic luminescence, upon the exposed ground. Conley and Shanira strolled leisurely along a farmer’s dirt track, through the rambling verdant hills, passing the odd small holding, nestled snugly within, and beyond… open fields, which were interspersed frequently with the occasional copse of trees, and spotted… hither and thither with shrubbery of many varying diffuse sizes and compositions. However, it was when they rounded a bend in the road… that Conley and Shanira were brought to a rather sudden and abrupt halt. They could hear a muffled voice off to the side; here – they could see a rider-less horse by the verge, which was indifferently chewing on a grass curd. It rather peculiarly appeared of all things… to be wearing a small golden coronet. Nonetheless, it was not so much – in point of fact, the actual horse that caught their eyes, but the two legs protruding from the hedge next to this – kicking the air frantically. The two of them, Conley and Shanira moved cautiously towards the thicket but on hearing their approach, the legs stopped momentarily flapping in their absurdly ineffective jig. “Is someone there?” a muffled voice enquired from within, attempting a cordial tone that nevertheless – seemed to have more than an edge of sheer desperation to it? “Errr, yes?” hazarded Conley as he stole Shanira a glance, not quite knowing exactly what else to say. If you don’t find writing challenging me thinks… you’re probably not doing it right! Again David Eddings ‘Belgariad’ for his take on a wonderful fantasy world, the depth of this, but the humour is absolutely outstanding. The feel of the books, the warmth, mixed with Terry Pratchett… who says something remarkably profound things at times about life, and perhaps human nature, while verging on the outrageously humorous. Frequently… from the lounge to my kitchen, and back again – carrying copious quantities of caffeine inducing amber-nectar loveliness. Primary a lady named Izabela Surlarz, who did an outstanding job of this… & Simon Goodway. However, I felt… while I valued their contribution, I think we should always ask the best of ourselves, and those around us. Finding good illustrators who you wished to commit, I have to say – at times … wish from that perspective I’d had felt that more from them. I was also dealing with ‘serious’ personal issues. When we commit to something, then we can create something greater than thesum of its parts! Paddington Bear, and his Magic Sunglasses. Although… it has to be said ‘all’ sunglasses are magical due to the fact they make you irresistible to women! What moves me… well people who commit to a cause and give everything to this! Fiona: Is there one person past or present you would to meet and why? Not one person, I take life’s lessons from everyone. Running… actually dash to Arthur’s Seat “every” ruddy day! While I’ll cry every time at the closing scenes of Braveheart, and I am assaulted equally with sniffles when I watch… Dances with Wolves and while I think the film Phenomena with John Travolta bestows a profound message… I like everything from to Sci-Fi! “Indie Rock,” but then I like music of any genre if it challenges me! My first ambition as I said was actually to join the army, but I would have liked to have been the fire brigade or be a teacher, doctor… something where you feel you are making a valuable contribution. Thanks for this intriguing opportunity to speak about my favourite subject… primarily “me!” Did I just say ‘me’ I intended to say my “writing” of course… ahem. That blew it, and it was going so well up to then, at least I thought so… damn, blast and bugger! And also is available in a number of bookstores… including Waterstones! Thanks for hosting Seb! 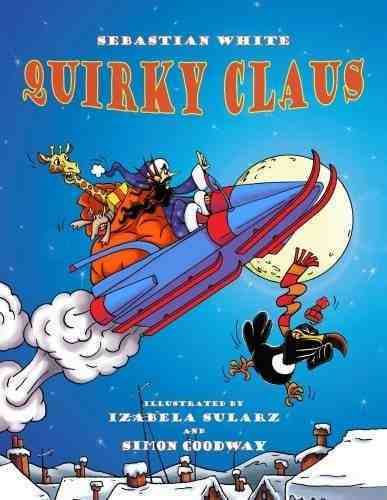 Quirky Claus is a great, fun Christmas book.